Hindus all along have, from time immemorial, been worshippers of God in form. We strongly believe that the formless, infinite Ishwara who is nitya (eternal), buddha (awakened), shuddha (ever pure) and mukta (ever free) does alone takes any form out of His compassion for devotees. One of the most essential and distinctive feature of Bhakti-maarga – the path of Devotion – is dependence on grace. The Gita speaks of two kinds of Grace: one is general or impersonal grace available to all people irrespective of whether they are Bhaktas or Jnaanis. (samo’ham sarva bhuteshu, Gita, 9.29). The other is a special, personal grace given only to the true devotee who has surrendered his all to the Avataara and depends on Him alone. Such a devotee’s spiritual and material welfare (yogakshema) God Himself takes care of. May we remember that every human body is like a temple wherein the heart of hearts is the chosen spot where God resides. While it is good to propitiate God in stone or marble, it is necessary that we should worship God in the poor, God in the sick and God in the illiterate. The worship of God in man should take the form of seva (service). Swami Saradaprabhanandaji, officials and devotees of our Centre join me in conveying hearty best wishes for the success of the Krishna ashtami celebration at your home and at your Centre or branches. May Lord Radhakrishna bless you all with devotion at His lotus feet! On this auspicious Krishna Janmasthami day, may the divine Lord take birth and manifest in our hearts. May He enact all His divine plays for our welfare and that of the world and as He lifted Govardhan for the safety of Vrindavan, may He lift the burdens of our life, so we may continue on our journey in divine bliss. Next Post: Why Ganesha ‘Lord of Obstacles’? Many many thanks for the blessing on Krishna Janmastami. WE celebrated here in a very small way. Nice to know that you also celebrated Krishna Jayanthi! The first time I saw in 2007 how the Janmashtami celebration is done here made me wonder. There were Satsangs every evening from the first day to the last ashtami day i.e. for all eight days! Satsang had a definite pattern. On the evening of the ashtami, Satsang had two sessions. Everyday I had to speak somewhere that is either at HQ Durban or any of our branches. At our Hq that is where I stayput generally, on Janmashtami day the program started at 6.00 pm with Puja to Lord Krishna by a devotee couple in the temple. Another couple did the last midnight arati. There were lot of bhajans and kirtans till the end of the prog that went on to past midnight. The temple was beautifully decorated. Finally with arati to BaalaGopaala and offering of flower to Him by every assembled devotee the prog came to an end. In India, in no centre of ours, had I witnessed such an elaborate festival ! The devotion of the devotees is worth noting; what a verve and vigour in singing bhajans! And faith and fervour in performing worship! And the day-long fasting and sitting in the temple for such long hours – absolutely maintaining utmost discipline – no chitchat, no gossip and all are tuned to the discourse and songs, well, I was greatly pleased and impressed with a new kind of experience! Our Pranams at Swamijee’s holy feet. Our Krishna Asthami Celebration was celebrated with the utmost of love and gaiety. We had a crowd of + – 100 people. Bhajans were sung continuously and at 12 midnight the ladies danced the Garba dance around the cradle. The cradle was decorated with flowers and finery, with baby Krishna. All devotees present, made flower offerings to the Lord and left dakshina at the Lord’s Feet. All our children sat up until past midnight, they were given a chance to sing bhajans and they recited the Gita verses, the children refused to go to their homes at 9.30 pm. All the children loved every moment spent in the shrine. We hope and pray that the same spirit of Love, Peace and Contentment continues to prevail in all of us. All in all, we had a most beautiful and spiritually awakening Janamasthmi. Please accept my Krishna Ashtami greetings & pronam. I would like to know what is meaning of the term “prapatti”? Does it mean self-surrender? Yes, ‘prapatti’ means Total Surrender or in in Hindi what you say ‘Sharanaagati’. The first five are the means to the attainment of absolute self-surrender. The Lord knows what is good for you infinitely better than you do. To resign absolutely to His Will is even a higher form of worship than visiting holy places and performing all sorts of ritualistic ceremonies. The Lord is waiting with outstretched hands to welcome you with His sweet smiling face, full of love and mercy. Lift up your face and approach Him with childlike simplicity, innocence and frankness (Arjava). Speak out your heart to Him. 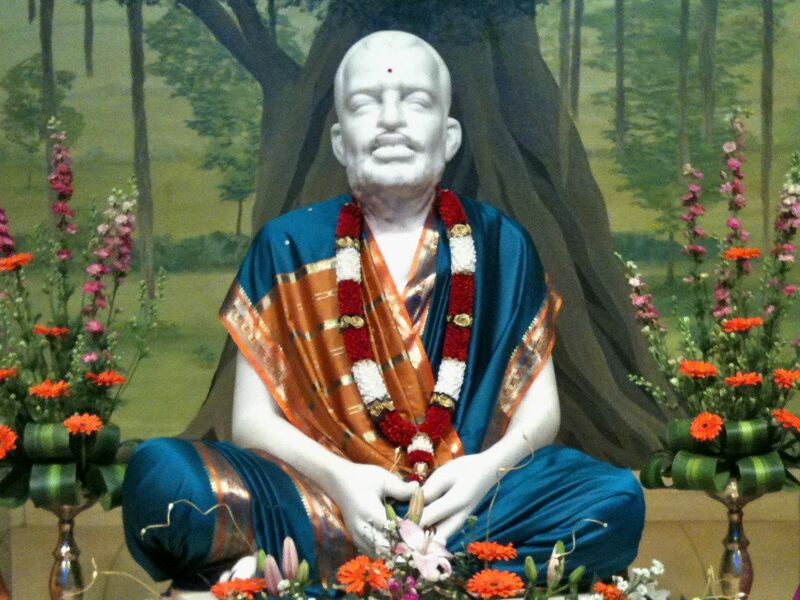 Do unconditional, total self-surrender (Atma-Samarpana) or Sharanaagati. If you could do willing, unconditioned, unreserved, absolute surrender, then all your duties and responsibilities are over. From then on God will take care of you in all respects. God will do everything for you, and you will find that favourable conditions are created for leading a virtuous and higher life. I was absent from Internet for a long time, because of my Respected Father’s sickness and subsequently passing away. As you are aware, not only I am an avid follower of VEDANTA IN PRACTICE, I always post the link it in Devotees of Holy Trio, so that they too can enjoy the Bliss of such nectar like words! Once again I seek your uninterrupted Blessings and guidance in my spiritual journey! P.S. : Maharajji, I have missed your tel nos because of change of Mobile Handset. My deep condolences at your beloved father’s demise. Please accept our respectful pronam. 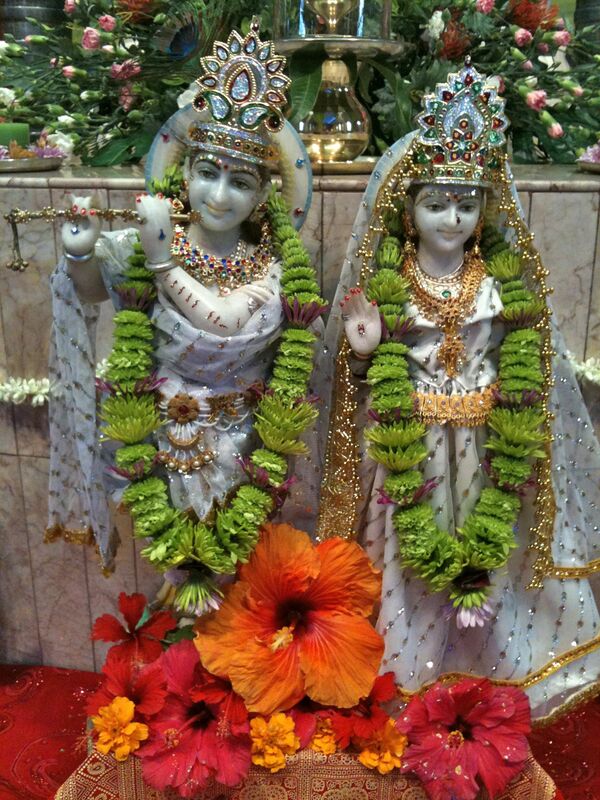 We have received all the stunning photos of Lord Krishna and Radharani and greetings on Krishna Ashtami. Those are beautiful. We also celebrated Janmashtami at our at our Jamshedpur Ramakrishna Mission on 1st Sept night. Please accept our pronam and bless us. Nice to know that you celebrated Janmashtami at our Jamshedpur centre. Yes, I remember to have seen one such function at Jamshedpur ashram some years back. The Ashram draws a large number of devotees. I liked especially those Bengali and Hindi bhajans on Radha and Krishna with lilting tunes that would reverberate the entire hall. May Krishna bless you with intense devotion! I am not sure if this note of mine will reach you. I do not know properly how to post reply in the blog. But I always read your blog and the subsequent correspondences. They are educative and bring peace of mind. The pictures of Krishna and Radha are very beautiful. It is great to know about the celebration of Janmashtami in the South African centres. I am moved by the poem written by Henry Scott Holland which you quoted in one of your reply. Sorry I could not write earlier as I was on continuous tour. Glad to know about Janmashtami celebrations there. Recently I came across RK Math new publication ‘Thoughts on Gita’ by Swamiji. It is quite interesting and giving new insights. While on Gita, have you read the commentary of Gita by Madhusudana Saraswati? What are the significant incidents in his life and teachings? I heard he was initially Advaitin and later turned Dwaitin. Is it true? Did he establish any Order? Would be grateful for a reply. Myself and Raji convey our pranam once again. Thank you very much for Krishna Ashtami greetings. Your inspiring gospel message has filled me with new hopes & has lifted my spirits.